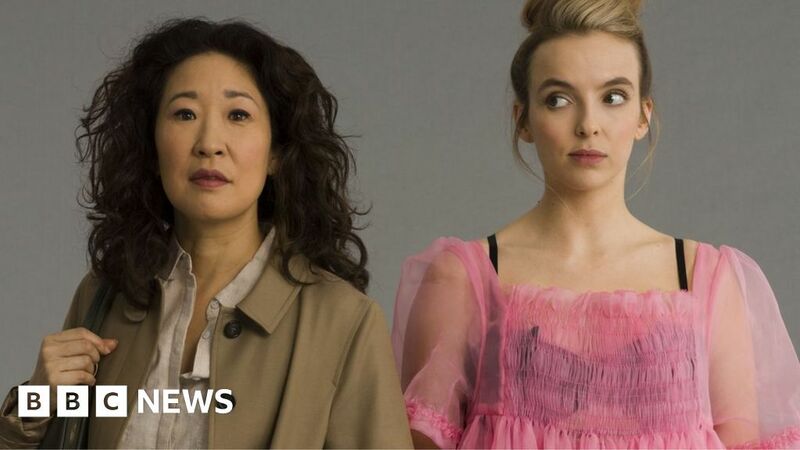 Series two of Killing Eve has premiered on BBC America, with critics praising its “twisted, darkly-comic notes”. The season opener picks up 30 seconds after the end of series one, when MI5 officer Eve Polastri, played by Sandra Oh, stabbed Jodie Comer’s charismatic assassin Villanelle. Rolling Stone said it was “a promising start”, while NBC News called the pair “one of the strongest duos on TV”. However, the date for a UK premiere has yet to be announced by the BBC. It is unlikely to be before early June, after all eight episodes have been broadcast on BBC America – a subscription television network jointly owned by BBC Studios and AMC. BBC America produces the thriller. Unlike the BBC’s domestic channels, BBC America is not funded by the licence fee. The first series of Killing Eve was broadcast in the US in April 2018, five months before it made its way on to BBC Three, BBC iPlayer and BBC One in the UK. It has been nominated for six Bafta TV Awards – even though Bafta’s rules say shows must have been broadcast in the UK first. The drama is based on Luke Jennings’ Codename Villanelle novellas and was developed for TV by Fleabag’s Phoebe Waller-Bridge, although she has handed over the reins for the second series. Speaking to the BBC’s staff website Ariel, producer Sally Woodward Gentle said of the new season: “You’ve got Eve, who has stabbed somebody, essentially in cold blood. She wasn’t physically threatened; there was nothing about that situation that said she needed to do that in self-defence. “So what does that reveal to her about herself? What does that do to her personal circumstances? Where does that take her as a human being? “Then you’ve got Villanelle, who you feel through the whole of the first season is slightly untouchable – you know, she can do anything, she can get into any situation, she can murder and escape and never get found – she is a psychopath. In its review, The Hollywood Reporter’s critic Rosie Knight said: “The premiere explores how Eve tries to keep her secret – that she committed an act of violence rather than having violence enacted on her – while still getting on with her life. Writing for BBC Culture, Caryn Jones said Killing Eve was “still a dazzling perfect storm of writing, acting and pacing”.